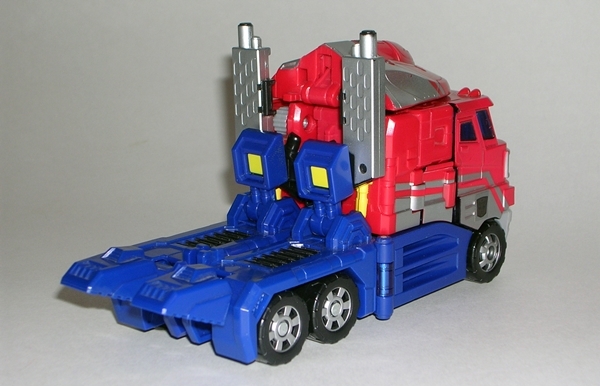 The packaging has been gone for a long time, so let’s jump right into Prime’s alt mode. 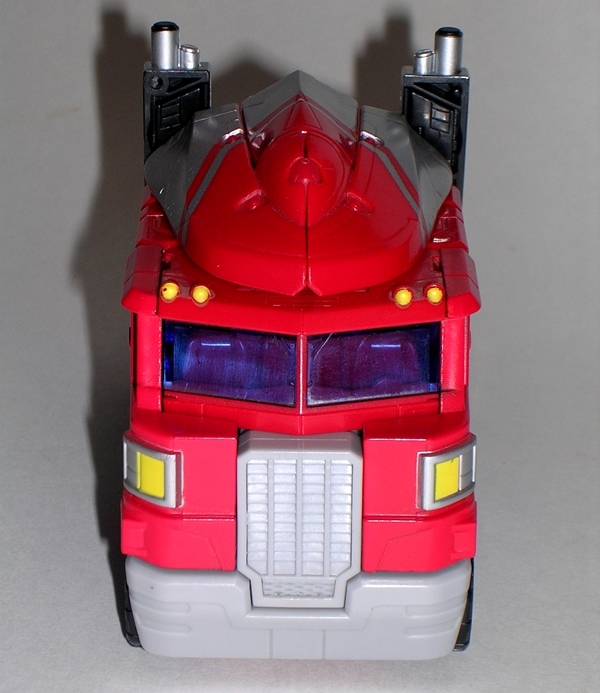 Yep, he’s still a red semi-truck cab which offers a solid homage to the original character toy, but Hasbro certainly went off the reservation on a few significant points. He’s less boxy and more rounded at the edges, and his windows in particular are pretty stylized. It’s a slightly sexier and modern look and I’m cool with that. If I had to pick one thing that bothered me the most, it would be the windows. They just don’t seem to fit with the rest of the design and it’s obvious the discrepancy has to do with the transformation engineering. We’ll come back to that in a little bit. Initially, I wasn’t a big fan of the cap on the roof, but that’s grown on me a little bit. 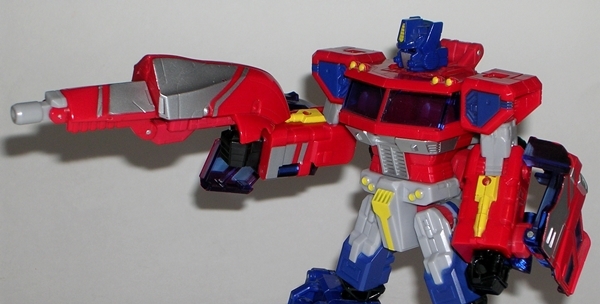 My main issue with the cap is that it’s basically there to hide the head and create an extra gun. I think the head could have been hidden with something a lot less cumbersome, and as we’ll see the gun that it forms isn’t a great pay off. I do like the deco used here quite a bit, as it’s fairly faithful to the original toy colors. He’s mostly red and blue, with some added silver. The grey used for the bumper and grill is a little jarring to me. I think it should have been painted closer to the side striping with a little metallic silver finish. 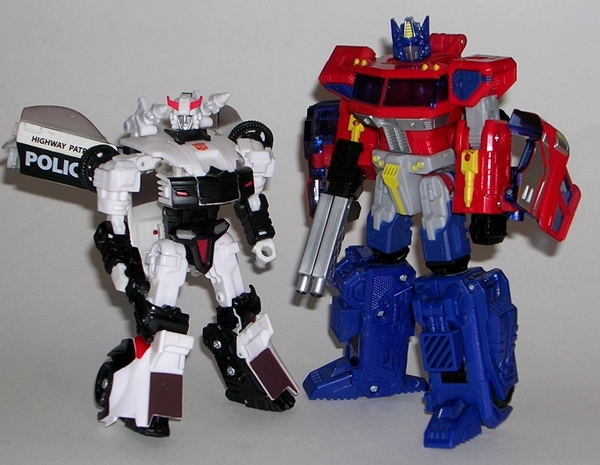 My only other gripe here is the lack of a regular Autobot insignia. Prime does have a rub sign sticker, but I’ve never been a big fan of these. 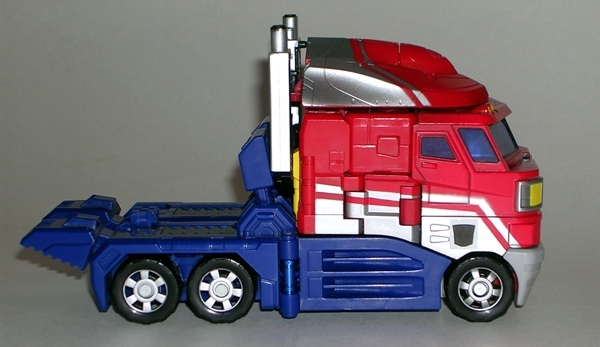 Still, combine this deco with the new design and I can appreciate Prime’s cab mode well enough. There are no miss steps to the reimagined design that I can’t forgive. Let’s transform him and see if the same holds true for his robot mode. Prime in robot mode is a damn frustrating figure. He’s got so much great stuff going for him, but a couple points of lazy design detracts from him a lot. The first thing worth mentioning is that his transformation relies on a bit of fakery. 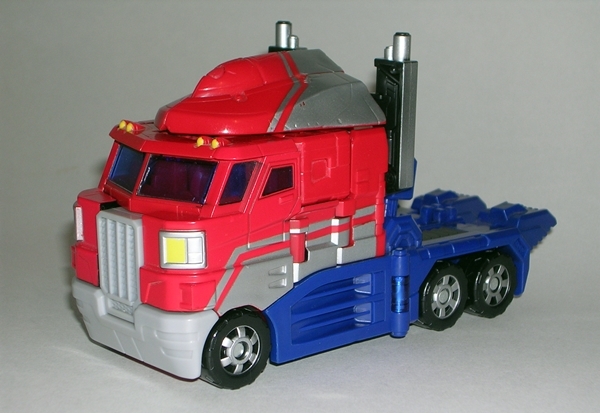 The lower part of his torso is meant to look like his truck grill, but the real truck grill winds up on his back. I’m not a big fan of that kind of hocus-pocus in my Transformers engineering, but it isn’t a deal breaker for me if it’s done right. 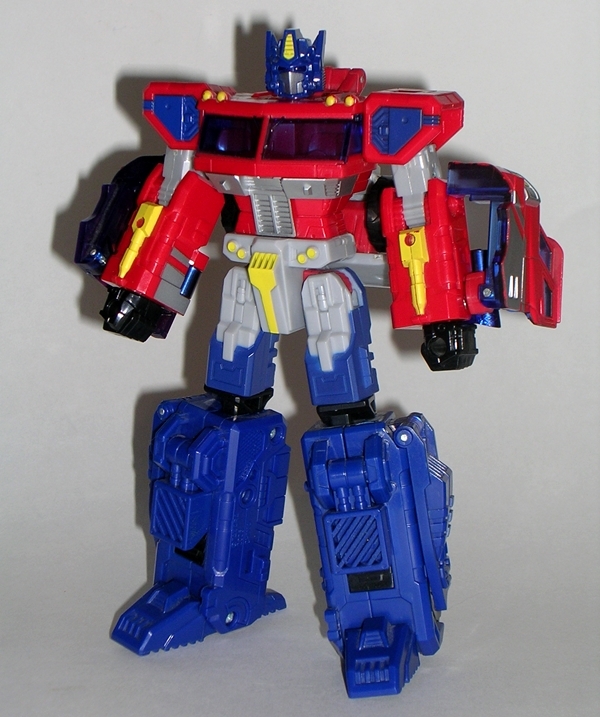 If we’re talking about Prime’s torso and legs… he’s done very right. There’s a great stylized design to him that makes the fakery well worthwhile. 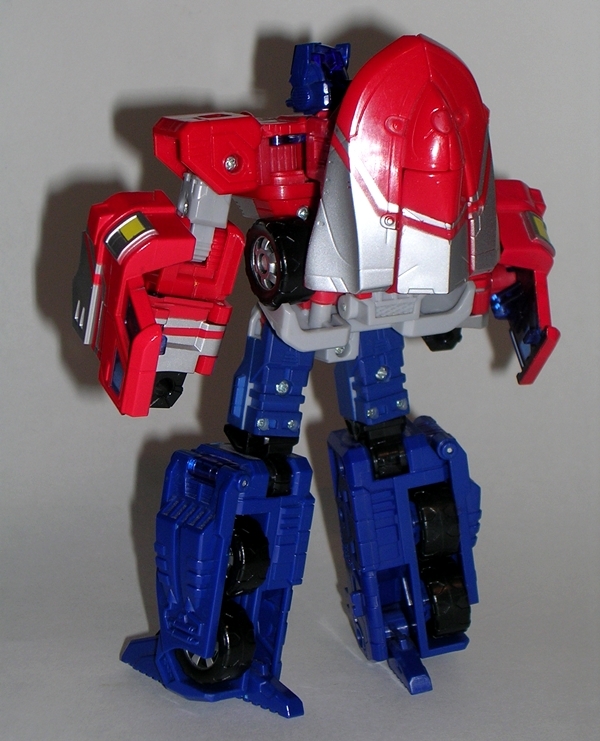 He looks fantastic and very much like the Prime toy that I’ve always wanted. 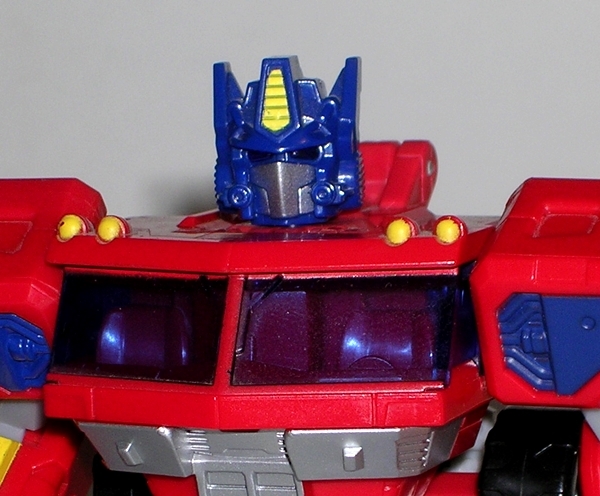 The head sculpt isn’t among my favorite Prime heads, but it’s not at all bad. So what’s the problem? First off, the horrible truck shell pieces that hang off his arms. They hang there, they flop around and get in the way. Basically, they’re ugly and awkward. An extra hinge to help them wrap around the arm may have helped. Maybe if they actually looked like armor and not just truck pieces hanging off of him. 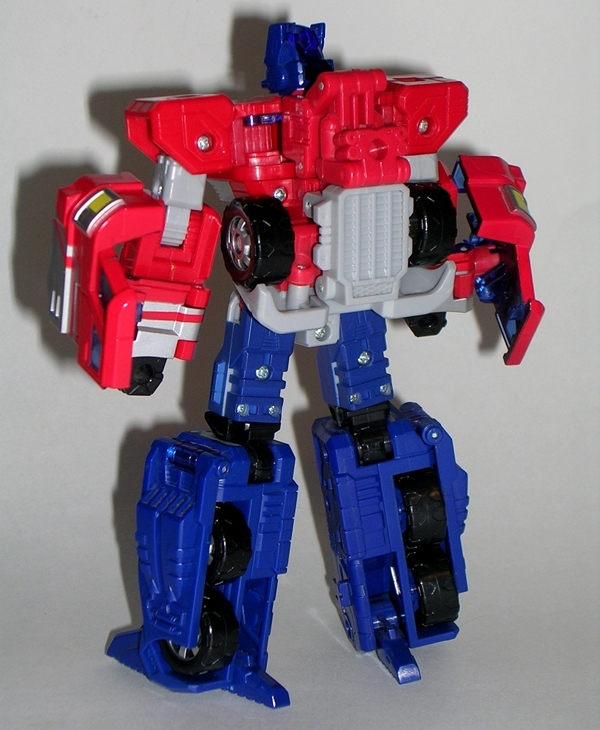 But whatever the case, he always looks like he’s mis-transformed or missing a step somewhere. It looks like the designers kept thinking, “Yeah, the arms… we’ll worry about them later” only later never came. 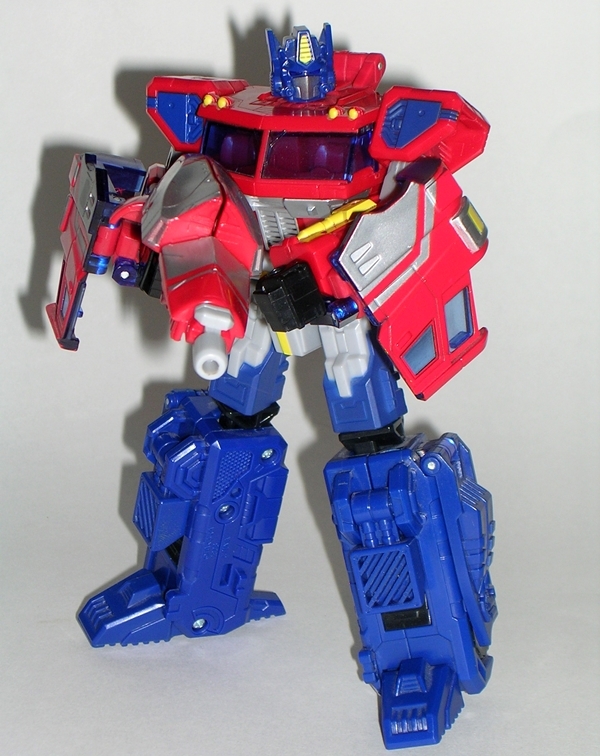 I’m not a fan of parts-formers, but in this case, I would have been perfectly fine if you could have just pulled these pieces off, because they practically destroy the figure by being there. Prime’s main weapon comes out of his smokestacks. It’s not his traditional looking rifle, but I do like it a lot. It’s a clever use of the smokestack part and I think he looks pretty good holding it. The cap/backpack gun is slightly more complex in transformation. 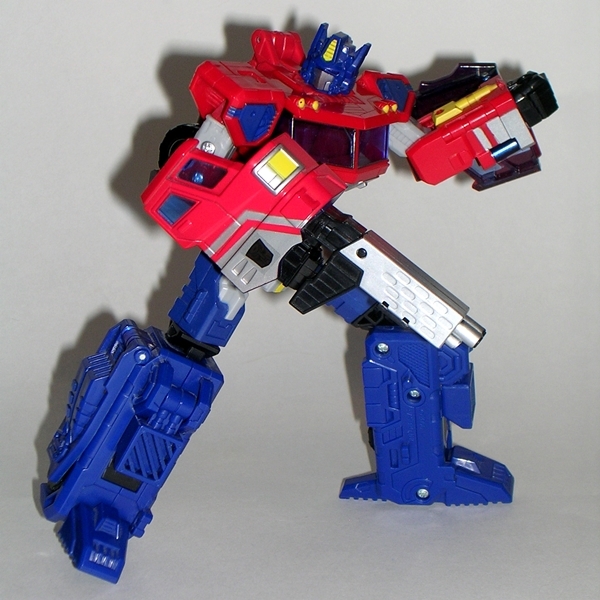 It’s an ok gun, but rather unwieldy and I don’t like that it’s the same deco as Prime himself. Like I mentioned above, it isn’t worth the payoff of having the big cap on the truck cab. Classics Prime is a fun toy, and he’s definitely one of the better Prime figures that Hasbro has put out since. 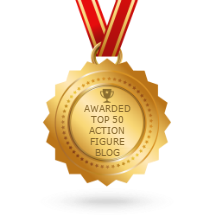 I’ll concede that’s a bit of a loaded compliment, but I do think he deserves more kudos than scorn. That having been said, it’s hard to overlook the truck kibble on his arms. I can remember the first time I transformed him, I kept looking back at the instructions to see what I was doing wrong, only to find out that there was nothing wrong, that’s what his arms look like. If I’m blowing them out of proportion, I think the problem here was that I was so excited about Hasbro doing updates to G1 characters, my expectations were too high. In the end, I’m far more willing to dismiss a terrible figure than forgive one that mingles with greatness but falls flat because of one or two major flaws. 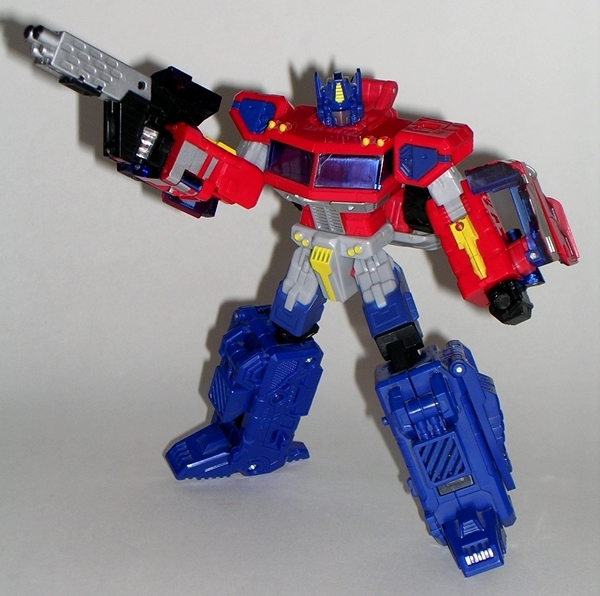 Prime is sadly one of those figures that could have been close to perfect, but missed the mark because of some lazy design elements.